Seeing spiders in your house makes most people cringe. Reactions range from dread and fear to just plain discomfort. Most people’s first response after acknowledgement is to get rid of the spider. But what are the easiest, least dangerous and most effective ways to do this? Read on to find out! Unfortunately, these pests seem to be everywhere no matter where you live. From Florida to the Mid-west, to California, we all seem to find arachnids crawling about in our homes and apartment buildings from time to time. We see every size imaginable, small spiders that drop from the ceiling upstairs on invisible threads to bigger wolf spiders taking up residence in the basement. Whether it’s a few, many or even just one, most of us want not only want them to go away, but get rid of spiders in your home for good. These creatures breathe air just like us. They have eight legs that make our hearts beat fast when we see them walking on the floor or wall. But what’s worse is knowing that they have fangs. They use them to bite and inject poison. The good news is that they are primarily predators only to their normal prey: insects they trap and eat for food as well as others of their same species (evident from the webs we see so often). Except for a few like the brown recluse, black widow or hobo types, the common house spiders are not harmful to humans. Removing spiders from your house can actually be difficult without the right help. First, your main motivation is usually fear-based, so it’s hard to just get up close and personal with a spider in your bathroom and take care of it by hand. Second, spiders are actually not bothered very much by humans. They will run or curl up in their own fear if they’re timid; but sure enough, as soon as you leave they’ll be right back. The same is true if you use the wrong approach when actually trying to get rid of these eight-legged creatures. If you tear down their webs they’ll build a new one. If you spray them with spider poison that doesn’t work well, they won’t leave. You need to use a fast-acting, effective and safe chemical. Two such types are described below. There are many sprays out there that claim to kill spiders in your home. Crazy enough, they don’t all work well on all types. The big-box stores will carry these products, but all you have to go off of are labels. If you want a general spray that will A) kill small and big house spiders and B) deter others from coming back, you need Terro 2300. Here are the basic steps for using this product. It’s actually pretty simple, because you’re armed with a product that really works. Spray the spiders you see: Go to where you frequently see spiders and look for these guys. Shake the can vigorously for a few moments then shoot to kill. Most small ones won’t need much of the spray to die within a few seconds of making contact. Larger types may take a little longer. You don’t need a lot of this stuff, but you may feel better if you zap them several times until they’re saturated. Realize that even if they are still crawling away up a wall or behind something, or are even writhing, they are doomed. You’ll find that they simply will die. 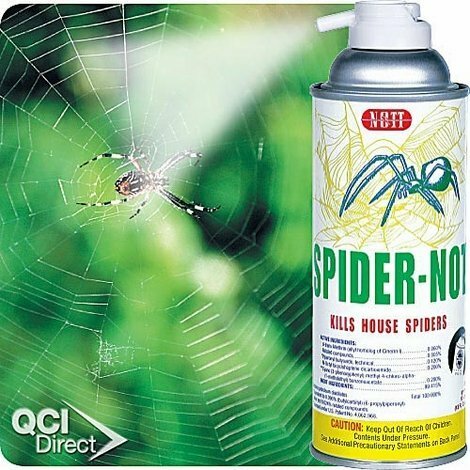 Spray for spiders you don’t see: Because there are surely more spiders than you can visibly see, your goal now is to cover the general area where they’re noticeable. When they come out and into contact with this solution after it’s dried, they will not survive. So, spray in all areas you think spidesr hang out or come into your house. This includes: cracks, crevices, air vents, under sinks, behind toilets, corners low and high, door jambs, window frames, light fixtures, etc. You don’t need to “fog” the room, but just get a nice, medium layer of spray on these kinds of parts. Within 24 hours, you will see a few dead spiders, and possibly many if you’re outside on a deck, patio or crawlspace. Again, you may have more of these pests than you realize in your house. But that’s okay, you’re doing something about it and giving yourself peace of mind. This particular spray is not only effective, it’s safe. It’s recommended that you use a mask if you’re doing heavy spraying. And you’ll want to keep all other people and pets away while you spray and while the product dries. Follow the directions of course, but once everything is dry, it’s safe for children and pets to be around it. Over time, you may need to reapply if you start seeing spiders again. 2-for-1 deal on this now! The solution above is definitely geared for taking care of house spiders en mass. It will also keep them out. But what if you’re not out to kill dozens of spiders and don’t want to fill your house with a spray? There’s another great product that works especially well when you find just those one or two occasionally in your home (but want to rid them immediately!). Spider-Not is probably more for you. It kills on contact, and while it’s in a spray can, it has a more powerful spray that can reach longer distances. Think of it as your baseball bat to help you get rid of a spider stuck high on your ceiling or one zooming across the floor. As with the Terro product, this solution is safe for people after it dries and keeps spiders from coming in and around your house after it dries with it’s poisonous barrier. Because of it’s built-in reaching ability, use it on roofs, overhangs and under decks outside, and up in attic rafters, behind furnaces and water heaters in basements and beneath stairwells inside the house – anywhere spiders make webs in your house. It’s also very helpful for tall ceilings and hard-to-reach light fixtures. Some people, keep this stuff near their bed. Nothing is worse than staring up at a spider directly above your head before going to bed at night! It goes without saying that if you don’t want spiders in the house, then you need to seal off small entrances. Use caulking and foam – cornerstone products for any home repair and maintenance efforts. Along with that, use one of the sprays mentioned above to make your barrier. If one gets through, it won’t like what you’ve put down in it’s path. Outside your house, you should tidy up.Don’t keep debris, messes or stacks of things too close to the house. Firewood is a good example. Piles of objects or messes stored near your home’s foundation just invites a place for insects (spider food) to take up residence. This tells your eight-legged friends they too can set up shop. As such, it’s just a matter of time before guys like garden spiders get inside the house; through windows, gaps in the foundation or any other place. Once inside females can lay eggs, and the rest is history. Follow the above tips and use the products mentioned to keep spiders out of your house and live more comfortably.